LAGOS, Nigeria — The girls in the school dorm could hear the sound of gunshots from a nearby town. So when armed men in uniforms burst in and promised to rescue them, at first they were relieved. “Don’t worry, we’re soldiers. Nothing is going to happen to you,” one 16-year-old girl recalls them saying. Three weeks later, 276 girls are still missing. At least two have died of snakebite and about 20 others are ill, according to an intermediary who is in touch with their captors. Their plight — and the failure of the Nigerian military to find them — has drawn international attention to an escalating Islamic extremist insurrection that has killed more than 1,500 so far this year. 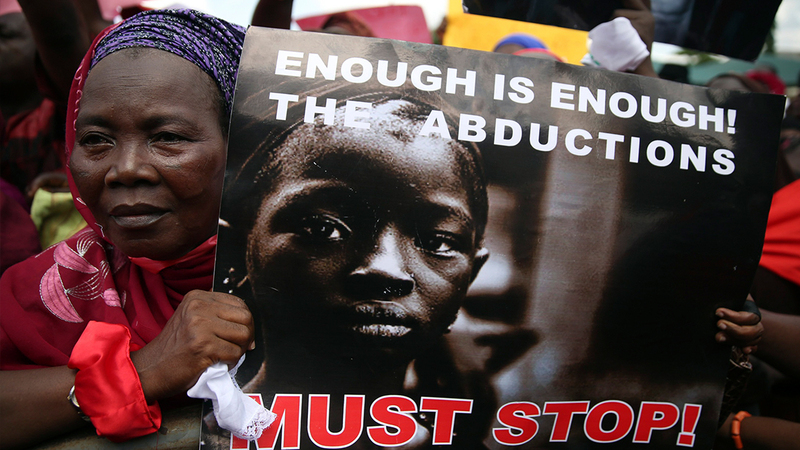 The group known as Boko Haram – the name loosely means “Western education is sinful” – has claimed responsibility for the mass kidnapping and threatened to sell the girls. The claim was made in a video seen Monday. The British and U.S. governments have expressed concern over the fate of the missing students and protests have erupted in major Nigerian cities and in New York. The 16-year-old was among about 50 students who escaped on that fateful day and she spoke for the first time in a telephone interview with The Associated Press. The AP also interviewed about 30 others, including Nigerian government and Borno state officials, school officials, six relatives of the missing girls, civil society leaders and politicians in northeast Nigeria and soldiers in the war zone. Many spoke on condition of anonymity, fearing that giving their names would also reveal the girls’ identities and subject them to possible stigmatization in this conservative society. Lawal alerted the 15 soldiers guarding Chibok, he said. Then he roused sleeping residents and told them to flee into the bush and the nearby hills. The soldiers sent an SOS to the nearest barracks, about 30 miles away, an hour’s drive on a dirt road. No help arrived. When the militants showed up two hours after the warning, the soldiers fought valiantly, Lawal said. Although they were outnumbered and outgunned, they held off the insurgents for an hour and a half, desperately waiting for reinforcements. One was killed. They ran out of ammunition and fled for their lives. There were too many gunmen to count, said the girl who escaped. So, even after the students realized the men were Islamic extremists, they obediently sat in the dirt. The men set the school ablaze and herded the girl’s group onto the backs of three pickup trucks. The trucks drove through three villages but then the car of fighters following them broke down. That’s when the girl and her friend jumped out. The day after, the Defense Ministry put out a statement quoting the school principal as saying soldiers had rescued all but eight of the girls. When the principal denied it, the ministry retracted its statement. With confidence in the military eroded, the residents of Chibok pooled their money, bought fuel for motorcycles and headed into the dangerous Sambisa Forest. The forest sprawls over more than 23,000 square miles, nearly eight times the size of Yellowstone National Park, and is known to shelter extremist hideouts. Mutah Buba joined the search party hoping to find his two sisters and two nieces. They got directions from villagers along the way who said they had seen the abductors with the girls on a forest path. Finally, an old man herding cattle at a fork in the road warned them that they were close to the camp but that they and their daughters could be killed if they confronted the militants. The searchers returned to Chibok and appealed to the few soldiers there to accompany them into the forest. They refused, point blank, Buba said. Parents in Chibok are asking how is it that they came within a couple of miles of their daughters, yet the military did not. “What was strange was that none of the people we spoke to had seen a soldier man in the area, yet the military were saying they were in hot pursuit,” said Buba, a 42-year-old drawn home to Chibok by the tragedy from Maiduguri, the Borno state capital 80 miles to the northwest. “Every information relayed to security agencies has so far been investigated, including the search of all places suspected as a possible hide-away of the kidnapped girls,” Information Minister Labaran Maku said Friday. Many soldiers have told the AP they are demoralized because Boko Haram is more heavily armed and better equipped, while they get little more than a meal a day. Some of the kidnapped girls have been forced into “marriage” with their Boko Haram abductors, sold for a nominal bride price of $12, according to parents who talked with villagers. Others have been taken across the borders to Cameroon and Chad, they said. Their accounts could not be verified but forced child marriage is common in northern Nigeria, where it is allowed under Islamic law but not the country’s Western-style constitution. The mother of six wondered what would happen to her daughter’s lofty ambition to become a doctor. She said the girl spent her time caring for the family and would cook whatever her mother wanted to eat. Spurred by growing national outrage, President Goodluck Jonathan on Friday set up a committee to work out a rescue strategy and expressed confidence that the military will find the girls. The only way to get the girls back is through negotiation, according to an Islamic scholar who has mediated the release of previous hostages. The scholar, who remained anonymous because his position receiving messages from Boko Haram is sensitive, said the militants are willing to free the girls for a ransom but have not specified how much. The 16-year-old who escaped keeps thinking of her friends and wondering why she was able to get away while they are still captive. She is at times afraid and at times angry.